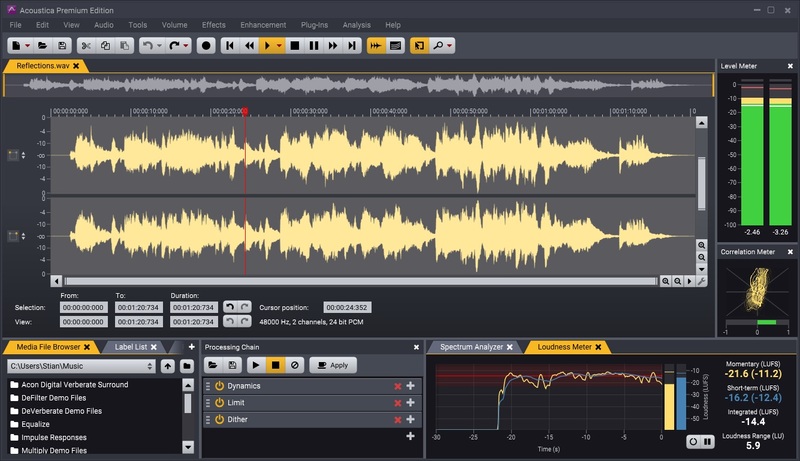 We have just uploaded Acoustica 7.0.18 with many workflow improvements and bug fixes. Sort options for label and region lists. Remember encoder settings when closing application. Waveform view settings (optional indication of illegal value range, zero line and selection grid in clip editor). Last tool and plug-in settings are now persistent. Amplitude range, minimum frequency and drop rate settings in real-time spectrum analyzer. Separate storage of last used “Save as” and “Open” audio folders. Clip editor crash recovery files now include labels, regions and meta data. Selection with shift and arrow keys in clip editor. Click on zoom scrollbar background moves view to click point. Please see the change log for a complete list of changes. ← Acoustica 7 is Here – Now for Mac and PC!